QTiering supports 3 tiers of different drive types. 6G MUX board needed for 2.5" SATA drives in dual controller system. A newly created auto tiering pool is based on thin provisioning technology. Each tier works based on one or more disk groups. To increase the capacity of an auto tiering pool, any tier (disk group) which contains either one tier of SSDs, SAS HDDs, or NL-SAS HDDs can be added to the pool any time. The following is the storage architecture of an auto tiering pool. Auto Tiering 2.0 supports flexible RAID and disk configurations. You can create each tier (disk group) with different RAID levels and different a quantity of disks. For example, SSD tier uses 4 disks with RAID 10 for extreme performance, SAS tier uses 6 disks with RAID 6, and NL-SAS tier uses 8 disks with RAID 5 for capacity. This feature is very important for IT administrators to arrange storage plans flexibly. QTiering, an auto tiering storage management system, manages the data relocation and monitors the data hotness ratio using half-life coefficient and advanced ranking algorithm. QTiering operates on three major functions. The volume is divided into 1GB units, which is called a sub-LUN. This is the basic unit of data movement among tiers. Whenever there are I/O requests, the activity level of a sub LUN is determined by counting the read and write frequency to the sub-LUN. Access records of each sub-LUN are collected and analyzed every hour. LVM maintains a cumulative I/O count and weighs each I/O by how recently it arrived, using a half-life coefficient. The ranking algorithm then uses these statistics to calculate the percentage of hot data. The data relocation engine then uses these percentages as guidance to move sub-LUNs between storage tiers automatically. The data relocation process will not stop I/O services. When data relocation begins to move sub-LUNs from slower tier to the faster tier, you will notice the I/O performance increases over time. 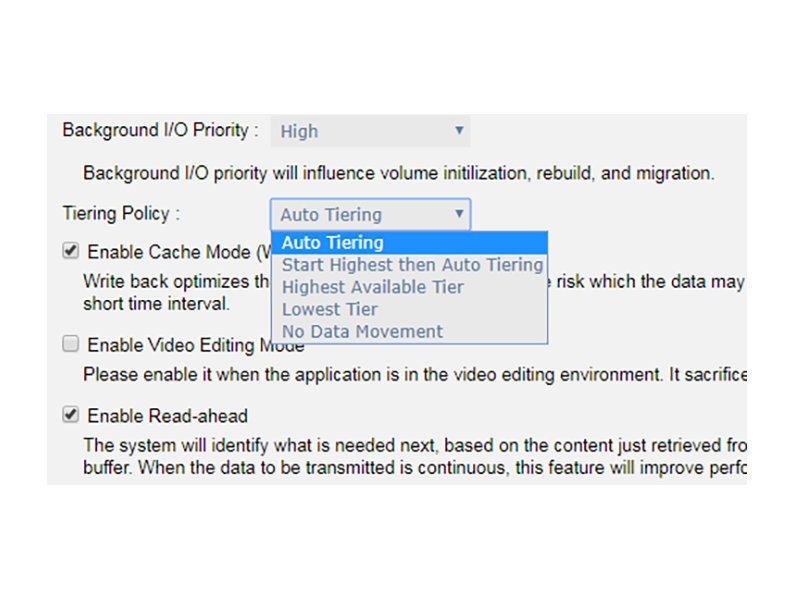 For the best performance in various environments, auto tiering has a completely automated feature that implements a set of tiering polices. Tiering policies determine how new allocations and ongoing relocations should apply within a volume for those requirements. Sets the initial data placement to the optimized tier (disk group) and then relocates the data based on the statistics such that data is relocated among tiers according to the I/O activity. First sets the preferred tier for the initial data placement to the highest tiers with available space, then relocates the data based on the statistics and the auto tiering algorithm. Sets the preferred tier for the initial data placement to the highest tiers with available space, and so as the succeeding data relocation. Sets the preferred tier for the initial data placement to the lowest tiers with available space, and so as the succeeding data relocation. Sets the preferred tier for the initial data to the optimized tier, and retains the data without movement. IT administrators can easily setup with our intuitive SANOS 4.0 web UI and arrange the storage plan flexibly by QTiering flexible architecture. 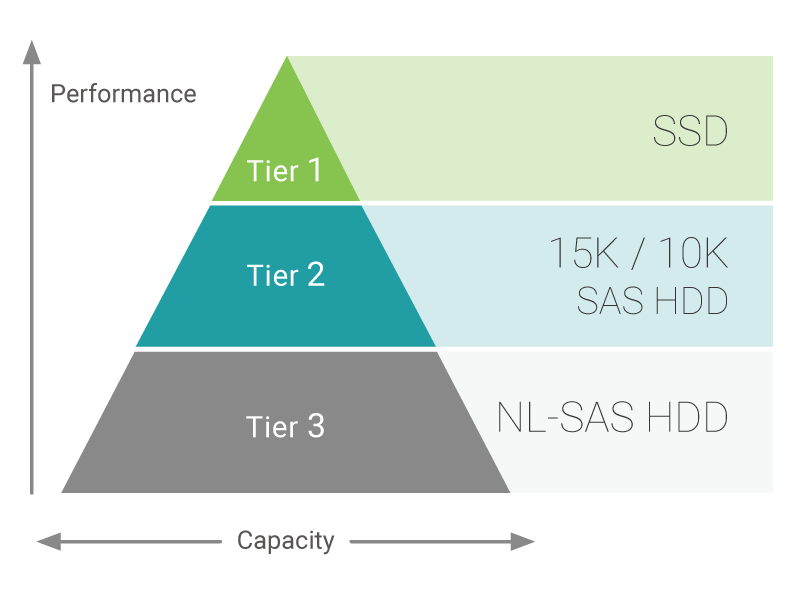 According to the data access frequency, continue optimizing the data across extreme performance SSD (SSD tier), performance SAS HDDs (SAS tier), and high-capacity NL-SAS HDDs (NL-SAS tier). 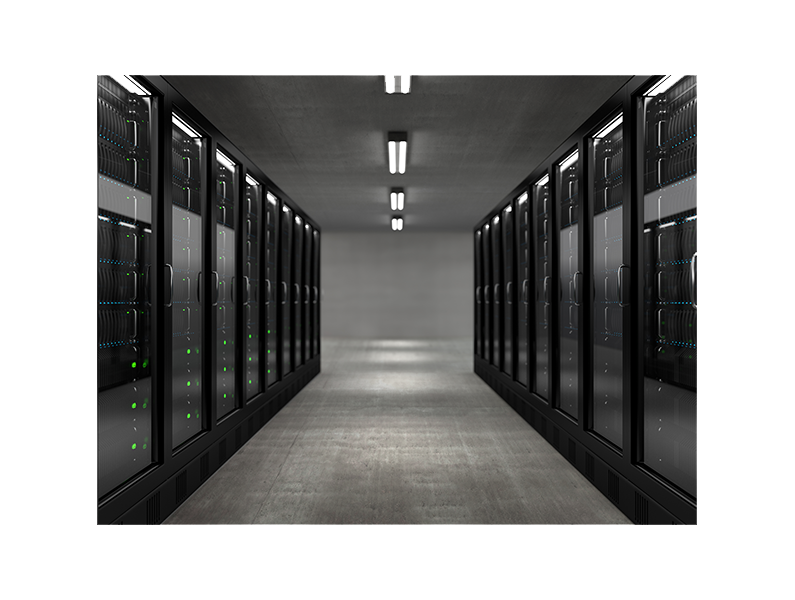 Purchasing only the required SSDs can lower the TCO (Total Cost of Ownership). Intelligently managing data placement can increase performance by moving the hot data to the performance tier. The relocation of auto tiering can be scheduled during off-peak hours to avoid affecting the system performance in office hours. By monitoring the tiering status on each pool, you can dynamically adjust to a more accurate policy. SANOS with QTiering technology provides a solution to achieve optimal storage efficiency and improved performance, making it the most cost effective storage solution for data center environments with dynamic workload changes. 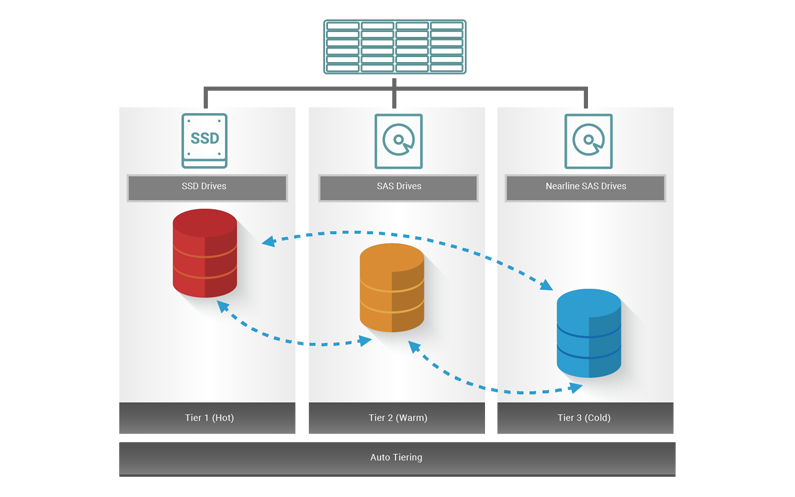 The SSD cache and auto tiering solutions can work together and compliment each other. A key difference between tiering and cache is that tiering moves data to SSD instead of simply caching it. 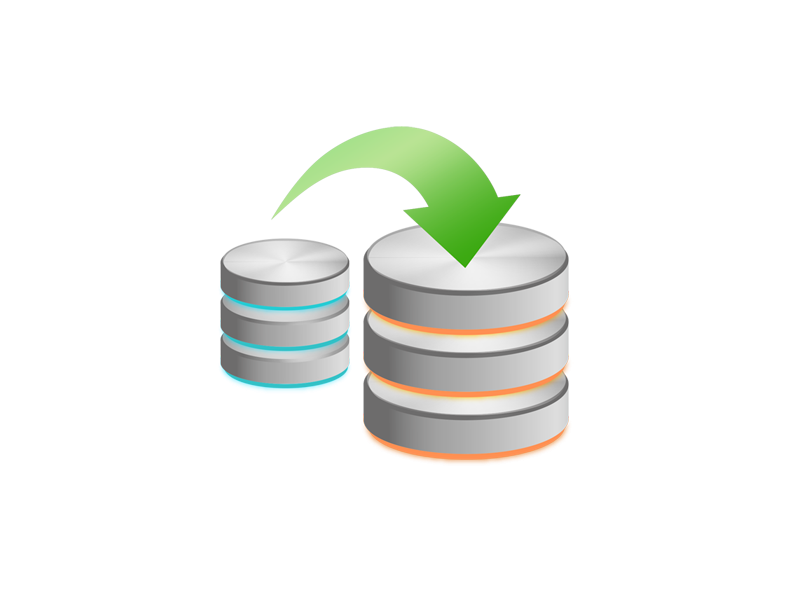 Tiering can also move data both from slower storage to faster storage and vice versa. However, SSD cache is essentially a one-way transaction. The important difference between moves and copies is that a cache does not need to have the redundancy that tiering does. 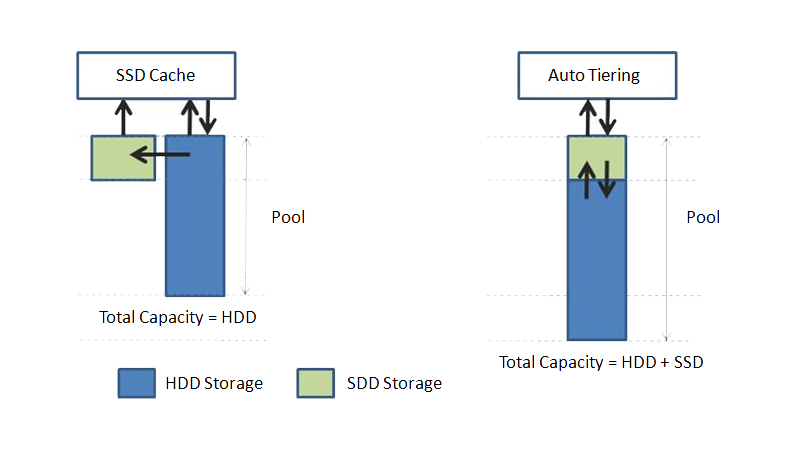 Total storage capacity in auto tiering is a sum of all individual tier capacities whereas in cache, the cache capacity does not add to the overall slower storage capacity. This is one of the key differences. In addition, SSD cache affects more rapidly than auto tiering because auto tiering will take effect after data relocation. So SSD cache warm-up timeframe is usually minutes/hours whereas tiering warm-up is usually days. SSD cache is used for highly frequent data access environments and is effective short term, such as virtualization or video editing applications. However, auto tiering is used for predictable I/O workloads and is effective in long term. It's suitable for web, file, or email server applications. The following is a general guide to the auto tiering pool planning. The user can fine-tune according to the actual situation. Suggest SSD tier using at least 4 disks with RAID 10 (better) or 2 disks with RAID 1 for extreme performance. Prepare SSD storage capacity in 10% to 15% of the total pool capacity to fulfill the requirements of critical high I/O applications. Suggest SAS HDD tier configuring with RAID 6 (better) or RAID 5. Prepare about 30% of the total storage capacity. 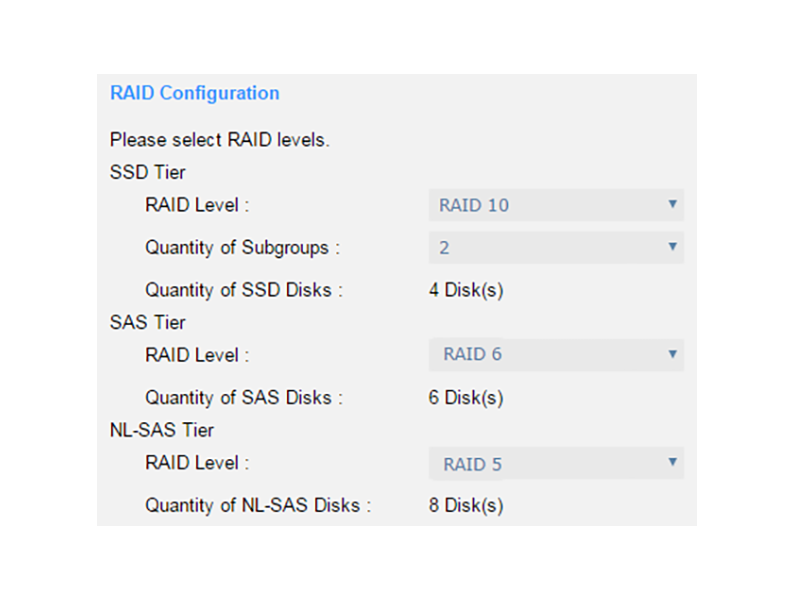 For capacity tier, suggest NL-SAS HDD using RAID 5 level to store cold data. This tier occupies the rest of the storage capacity. Suggest using "Auto Tiering" policy when creating a volume, and the relocation schedule remains in daily. These configurations show the best performance for auto tiering. Take an example for reference. First, you can estimate the total capacity used, and estimate how much hot data or high I/O your application uses every day. Assuming 666GB per day, the recommended SSD tier capacity is at least 1.5 times, 1.5 x 666GB = 1TB, as a conservative estimate. Then, calculate the SAS HDD tier capacity about 3 times of the SSD tier capacity, 3 x 1TB = 3TB, as if the SSD tier full of the buffer, so that the performance does not drop too much. This tier is optional. The remaining space is left for NL-SAS HDD tier. The following table is the summary for reference. This is a rough planning proposal. 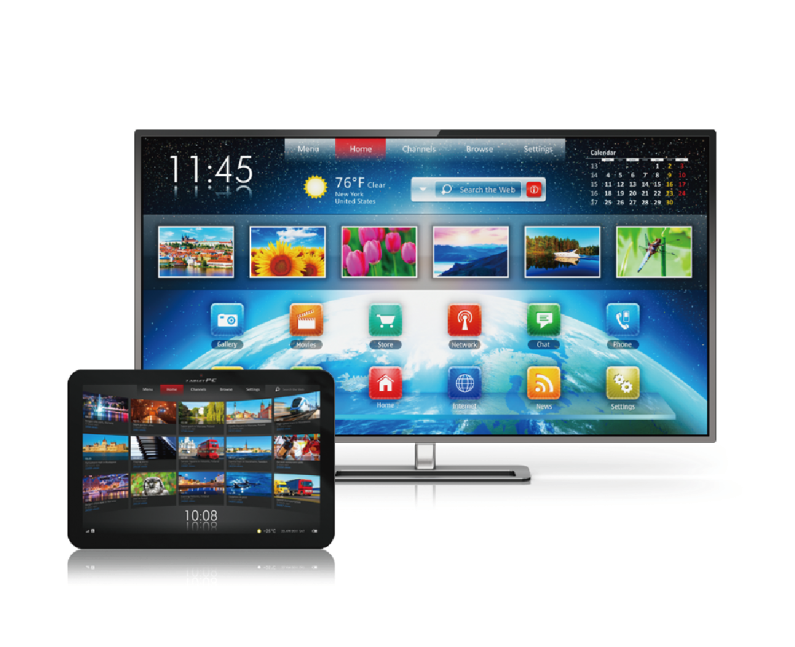 Whether to meet customer requirements also requires users to calculate the performance and necessary capacity. Of course, if more capacity is needed, you can also add a disk group to any tier. We assume that video editing has the characteristics of focus data over a period of time. When users edit a new video, the video remains at the SSD tier and performs extreme performance. After the editing is complete, the video moves to the HDD tier and leaves the space for the next video. Therefore, we recommend setting the auto-tiering policy to Start Highest then Auto Tiering. For more details, please refer to the Auto Tiering 2.0 White Paper. We simulate 8 VMs (Virtual Machines) running on a server, assume that they have different I/O queue depths and possess intensive I/O flows. We recommend setting the auto-tiering policy as Auto Tiering. At the beginning, 8 VMs run I/O by IOmeter. After working a while, Stop VM2~VM8 I/O but keep VM1 running I/O. The data in VM1 will be accessed more frequently than others. After analysis and relocation by auto tiering mechanism, the data in VM1 has been moved to a higher tier. At last, run VM2~VM8 I/O again, record the performance. The following table summarizes the throughput before and after the relocation and an improvement percentage calculation as a reference. This verifies the scenario and meets the expectations of VMware. In order to cope with an expected sudden event, IT administrators can move the required data to the SSD tier in advance. In general, we recommend setting the auto-tiering policy to Lowest Tier. The day before the activity, IT administrator manually set the volume containing the required data to Highest Available Tier and then performs Relocation Now manually to force relocating data. 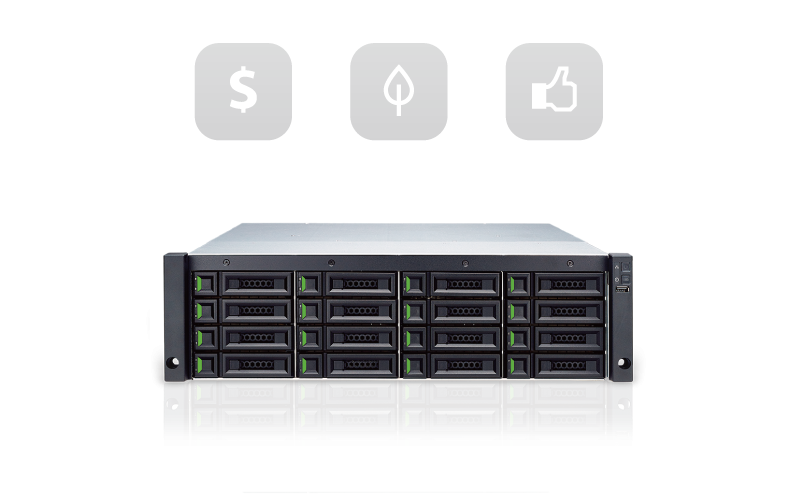 With auto tiering technology, the XCubeSAN series can help you put the right data in the right place at the right time for optimal use of all storage tiers and allow you to reduce storage costs and management overhead while increasing performance and capacity. Intelligent algorithm behind auto tiering manages the data relocation and monitors the data hotness ratio using half-life coefficient and advanced ranking mathematics. Relocations can occur on the user-defined relocation schedule, making auto tiering a truly automated offering.